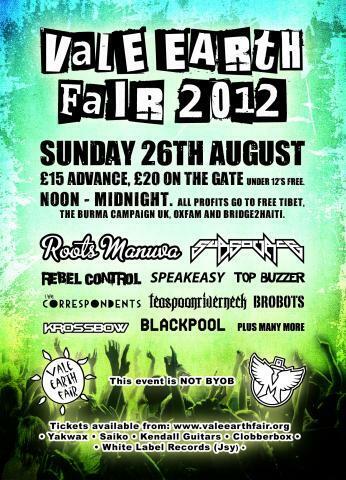 Vale Earth Fair 2012 full line-up announced. Advance tickets for £15- are now on sale from Saiko, Kendall Guitars, Yak Wax, HS2, Clobberbox, and White Label Records in Jersey, online at the tickets page. The price on the day is £20- at the gate, and children (12 and under) are free if accompanied by an adult. There will be the usual array of stalls, food tents, licensed bar, and children’s area, among other attractions, and profits from the event will go towards humanitarian causes the Burma Campaign, Free Tibet, Oxfam and Bridge 2 Haiti. The Vale Earth Fair is not a BYOB event.